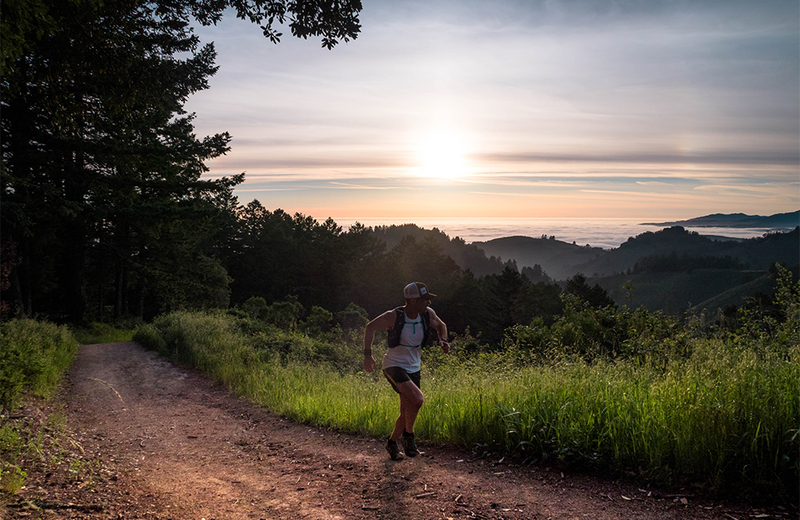 My run starts high up on Skyline Blvd in the main parking lot for the Purisima Creek Redwoods OSP . It begins with a steep downhill on the North Ridge Trail which quickly joins with Harkins Ridge. I follow Harkins on the left and admire the sweeping views of Half Moon Bay, billowy clouds and rolling fogs, the Pacific Ocean and Montara Mountain. Not far ahead, I meet up with the Craig Britton Trail and head left for my drop into the cool and darkened redwood forest. Craig Britton has many twists and turns as it meanders deeper down into the canyons. There are a couple of bridges and small streams to cross as you move closer to Purisima Creek Road. At this crossing I continue on course towards the Purisima Higgins trail head in Half Moon Bay . While cruising along this stretch, I notice some clearings that mark evidence of the ties this preserve had with the logging industry during the gold rush years. At the bridge crossing, I take some time to fuel up on some carbs and fluids because from here it is all uphill with very little relief. Across a small bridge, and to my left, the climb upwards starts at the Whittmore Gulch trailhead. Based upon the elevation profile, it looks like there is a 1500' gain over the next 3 miles. There are two more junctions along the way which I follow to the right. The first keeps me on Whittmore Gulch and the other puts me back on the North Ridge trail, which I follow all the way out to the parking lot. On a good day, I'm able to keep a slow pace up the last stretch of North Ridge back to the car. Running down it was fun in the beginning but getting back up can really hurt!